Harrisburg’s vibrant town center and fun community events are a huge draw for those who want to live in a peaceful and tight-knit neighborhood. Its superb location brings you close to some of North Carolina’s finest attractions, such as Concord Mills, SEA LIFE Aquarium, Wolf Lodge, the NASCAR Hall of Fame, and Charlotte Motor Speedway, just to name a few. It’s also less than half an hour away from Charlotte, making it ideal for those who want an easy commute to and from the city’s career and entertainment hubs. Bordered by Lake Norman, Huntersville is one of the most scenic towns in North Carolina. It also has a rich architectural heritage, which is readily apparent in the numerous historic landmarks scattered about town. Those who want to live here have a broad range of housing types to choose from, as well as a wide selection of desirable subdivisions. Skybrook and Highland Creek, two of the most sought after residential enclaves in Tarheel State, are located here. Mint Hill is no longer a bedroom community – these days, it’s become the kind of place where you live, work, and play. It has everything you need, from essentials like grocery stores and service providers to shopping and dining options. It’s also a safe community, with residents often serving as volunteers for the local fire and police departments. And thanks to Interstate 485, commutes from Mint Hill to places throughout Mecklenburg County are just within 30 to 45 minutes. Along with the neighboring town of Mint Hill, Matthews is known as Charlotte’s fastest-growing suburb, not just in terms of population, but also in terms of development. Gorgeous homes, community events, nature trails, and a wide selection of shops and restaurants continue to attract new residents and give current ones virtually no reason to leave town. The majority of shops and restaurants can be found along major thoroughfares like Monroe Road and Independence Boulevard. Its proximity to Mint Hill doubles the number of amenities available to those who live here. Located right next to Waxhaw, Marvin has a population of little more than 6,500, a fact that allows residents a great deal of peace and privacy. 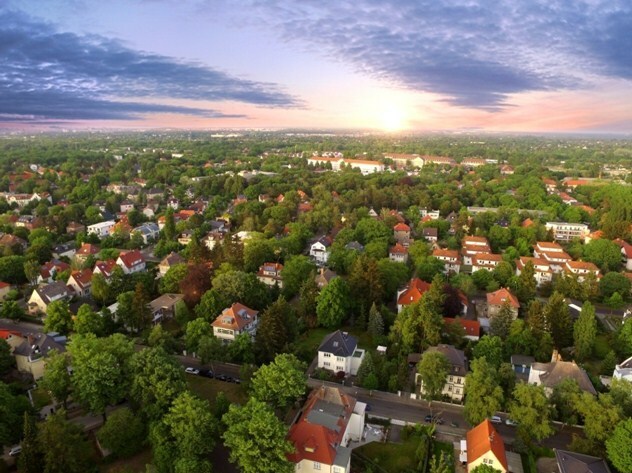 It helps that a local rule stipulates that no residential lot can be smaller than an acre, even if the town itself encompasses just 3.9 square miles. Though small in size and population, Marvin has one of the highest median household incomes in all of Union County. Those who live here enjoy a quick commute to Ballantyne and South Charlotte. The local elementary school is a Blue Ribbon School of Excellence, and the town has plenty of protected green spaces, such as the Marvin-Efird Park and the Marvin Loop. Waxhaw’s Main Street, which is lined with bars and restaurants, is just five minutes away. Located about 23 miles south of Charlotte, Waxhaw offers a laidback rural setting for those who want to live in a slow-paced environment but still have access to big-city amenities. The housing stock is fairly new, and there are a number of mansion communities within town limits. Waxhaw’s Main Street is filled with independently-owned shops and restaurants. Several festivals take place here throughout the year, one of which is the highly anticipated Kaleidoscope Fest, a two-day art festival held in May. This Charlotte suburb brings you the best of lakeside living. Cornelius is ideal for those who want to spend most days swimming and boating at Lake Norman or having picnics at Jetton Park. Buyers can choose from a wide range of housing options that include waterfront properties and single-family homes on wooded lots. For in-depth information on Charlotte’s suburbs, call the Zanthia Hastings Team at 704-947-2165 or send an email to zanthia@soldbyzan.com. The data relating to real estate on this Web site derive in part from the Carolina Multiple Listing Services, Inc. IDX program. Brokers make an effort to deliver accurate information, but buyers should independently verify any information on which they will rely in a transaction. All properties are subject to prior sale, change or withdrawal. Neither RE/MAX Executive Realty nor any listing broker shall be responsible for any typographical errors, misinformation, or misprints, and they shall be held totally harmless from any damages arising from reliance upon this data. This data is provided exclusively for consumers' personal, non-commercial use and may not be used for any purpose other than to identify prospective properties they may be interested in purchasing. © 2019 Carolina Multiple Listing Services, Inc. Data last updated 2019-04-25T09:59:02.723.